A huge array of Marble Revolving Dry Fruit Tray with 3 container is offer, which is extensively used for presentation of dry fruits and it is highly demanded due to its good quality. 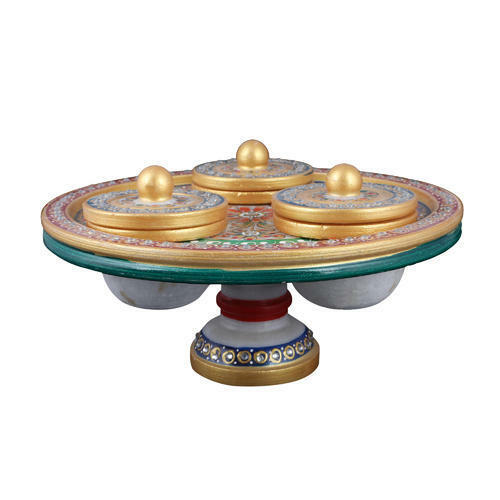 Further, the offer Marble Revolving Dry Fruit Tray is offered by us in different sizes. It is highly durable in nature and available at reasonable prices. This Decorative Marble Mouth Freshener & Dry Fruit Container will make an dinner table look resplendent with its mere presence The Decorative Marble Mouth Freshener & Dry Fruit Container contains three separate bowl shaped partitions to keeping a multiple number of mouth fresheners, as well as, dry fruits in the most aesthetic of settings. This marble container features exquisite design work to make it suitable for the most lavish of dinner tables, and other surroundings. Moreover, the quality of the design work present on its body complements the finest grade marble used in its construction to make it suitable for even the most regal of households.